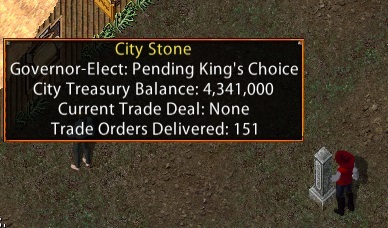 For some time now we been trying to find new ways to increase the city treasury with gold. It seems that our voices have been heard and we are going to get help from the traders associations. 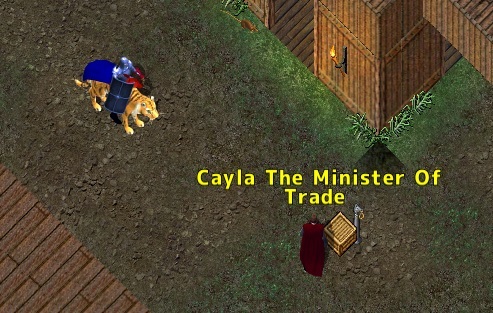 I went to seek out the Minister of trade near the docks. The Minister told me that there is a possibility to trade goods between the cities. He explained that this way we could earn funds for the city treasury. The amount would depend on what items, how many items and the distance travelled to the other city. 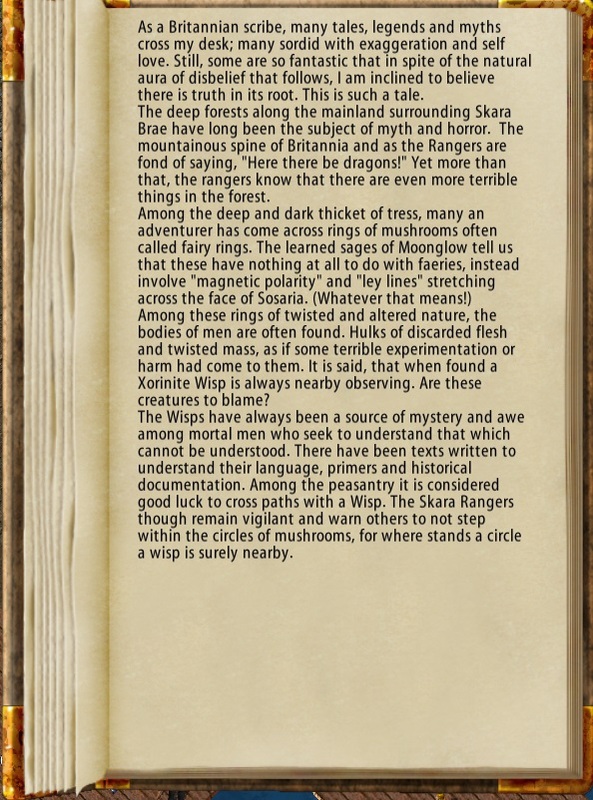 Also the risks met on our journey would be taken in to account. 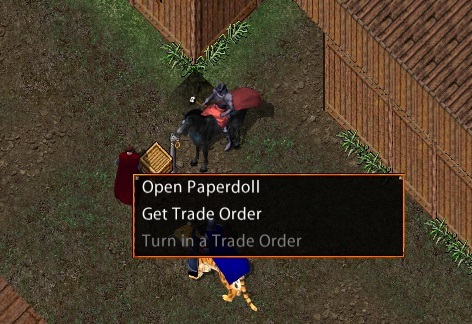 I requested the Minister to give me one of these trade orders. But before he would gave me the order, he wanted me to sign a contract. 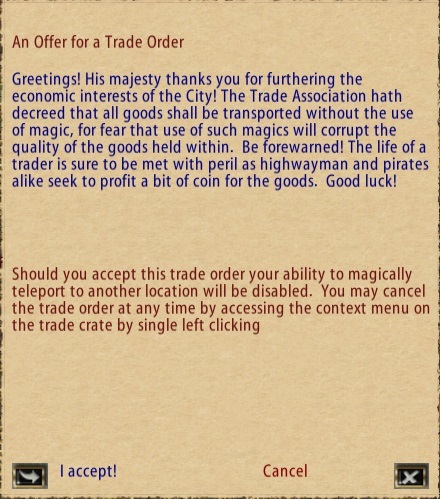 The interesting part of the contract was the ‘transport without use of magic’ part of it. For a warrior such as I that is not really a problem but using public moongates will forfeit any distance bonus and rare chance at rewards. I will have to travel on foot, on a mount and by ships. After I signed the contract I was given a barrel. 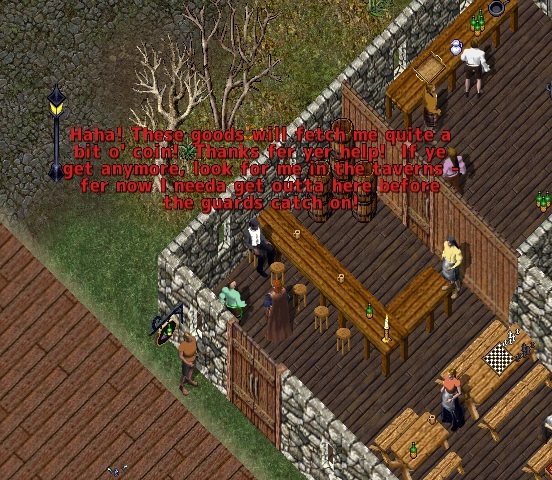 I had to deliver ten cloaks to Moonglow. While I was reading my order someone slipped me a note. Before I could see who it was the passerby was gone. 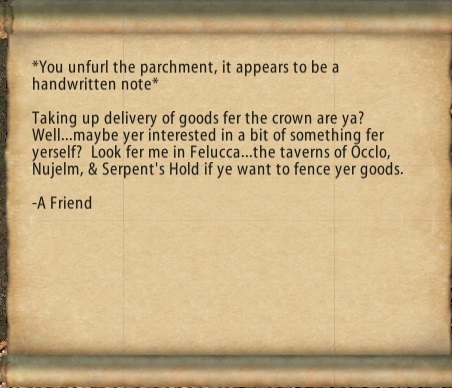 I looked at the parchment. Someone in Felucca has an interest in these deliveries! I need to know what this shady person wants but it might be best for me to send my friend who also lives in the shadows of Felucca. In the meantime I contacted a few friends to help me with my delivery to Moonglow. They had a ship to take me off Jhelom. 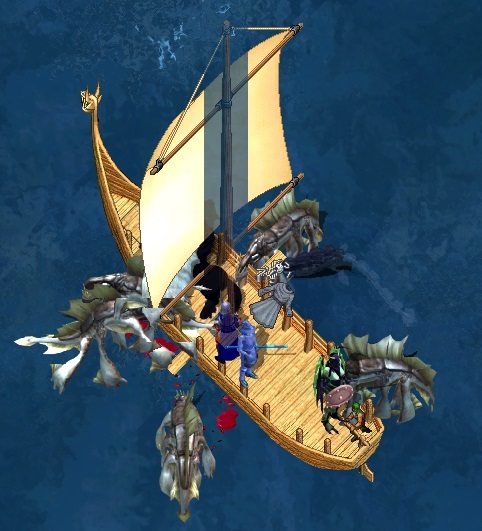 Just after we left the guardzone of Jhelom and came near the ship we were ambushed! 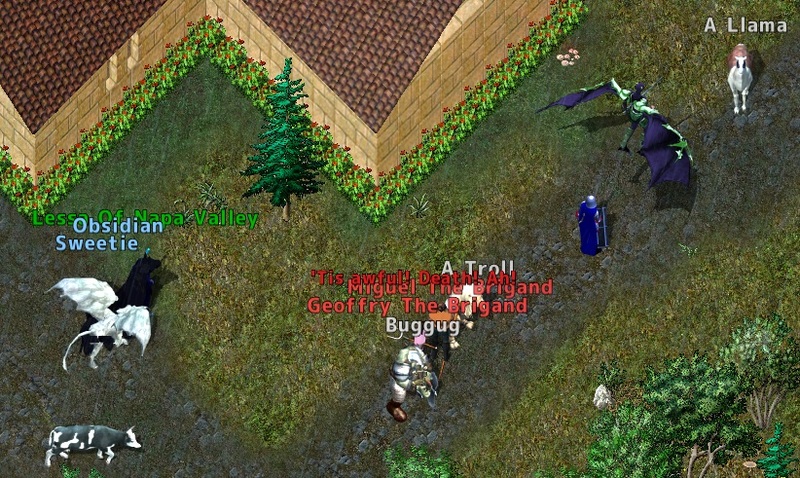 A group of orcs and brigands wanted our goods. It’s nothing we can’t handle but it was good I brought some friends. 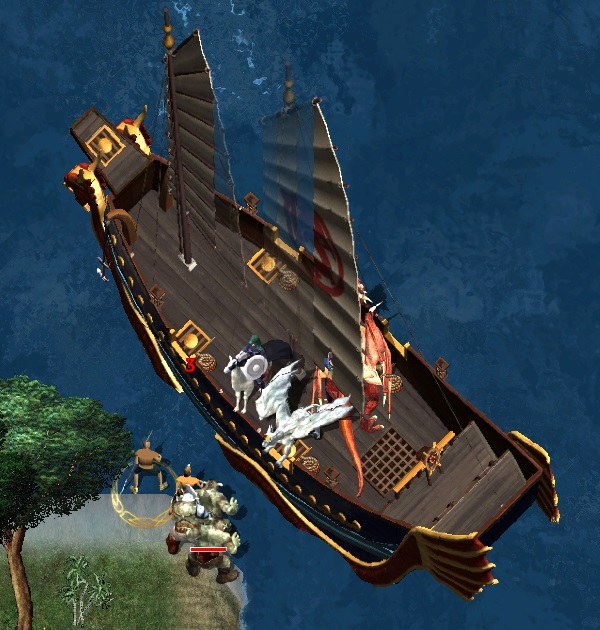 After killing the ambushers I decided to try to sail with a smaller ship to hope not to draw so much attention. That did not work well when we got attacked by several sea creatures. It seems that this trading business was not as easy as it sounded! Eventually we reached the Moonglow Island. We still had to run a bit to the town and again we were ambushed! 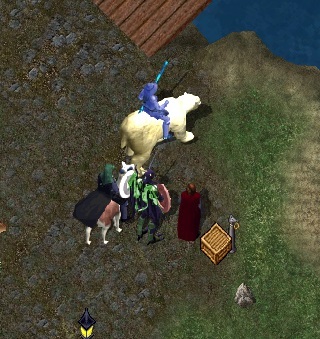 After winning our final encounter we reached the docks of Moonglow where we delivered the order. I was rewarded for our long journey. The gold will be good for the trade deals in Jhelom. This quest will increase your loyalty status with the cities. In the meantime my friend found Slim the fence in the tavern in Ocllo in Felucca. He gave her a different kind of reward and disappeared. Slim must benefit well from these deals, while our cities lose income from them. When you give Slim fifty orders you can become a smuggler. I will worry about this later after I read this new book I received for delivering the order. I haven’t done this yet. One part i find a little confusing in the essay above. Are the “10 cloaks” in the barrel or do I have to acquire 10 clocks and have them in my back pack, put them in the barrel or what? I’m guessing I need to get ten cloaks and have them in my backpack. Thanks! buy 10 cloaks from the tailor and put them in the container you are given by the minister of trade. There is a context menu on the container to ‘fill from backpack’. You are right, I was first in Serpents Hold and then sailed to Ocllo. I will edit that. Thanks!